There are so many stamps that could use a bit of a spray of snow – skiiers, sledders, santa on his sleigh. So let’s paint a little spray in watercolor, and add a few trees and a sky to make a simple scene out of it! Watch the video below or click HERE to see it in HD on YouTube. I did decorate the trees with some adhesive gems (very old ones, I don’t have even a package with the brand!) and added a few on the border as well. Snow beautiful, very magical to capture our cute fuzzy friends as they enjoy themselves too. Of course they go sledding at night, when else would they? They like to have fun without our eyes on them. Critters are shy. 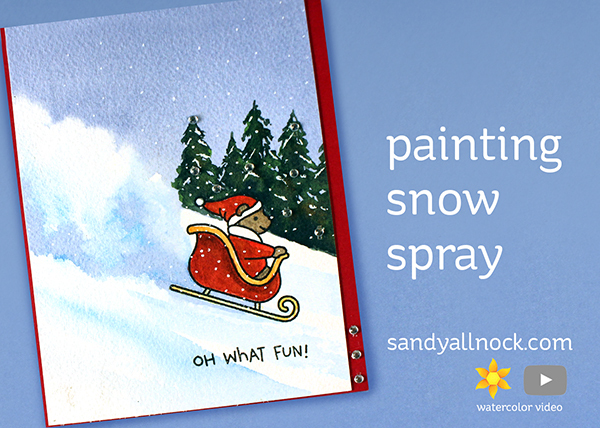 Great card, love the snow spray. Gorgeous Sandy and I am always looking with my mouth open how you make these awesome scenes! Thank you so much. Love love love the snow spray! It was fascinating to watch your video and see the scene come together. Great work. Oh wow, this looks so amazing! Great idea – looks like even more fun than the snow blizzards we were making with Copics a couple years ago. Don’t know how you keep coming up with new and different stuff to try – but I’m so glad you do!